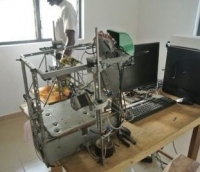 Inventor from the West African country Togo, Kodjo Afate Gnikou, created the first 3D printer from electronic equipment worth less than $100. 33 year old Afate made an experimental functional 3D printer using an old desktop case, part of the diskette drive, parts from discarded scanner and printer found at the local dump. For the realization of his project, he launched a campaign on crowdfunding service Ulule and thereby raised $4,000. These funds have helped in the preparation of the device, which is called W.Afate. The letter W in the name of 3D printers means WoeLab within which Afate operates. WoeLab is the first African tech incubator with headquarters in the capital of Togo, Lome. The author of the first 3D printer made from industrial waste is trying to prove that people and companies from Africa also have their place in the IT market, and that they want to solve the environmental problem that afflicts African continent, which is amassing a large amount of electronic waste.